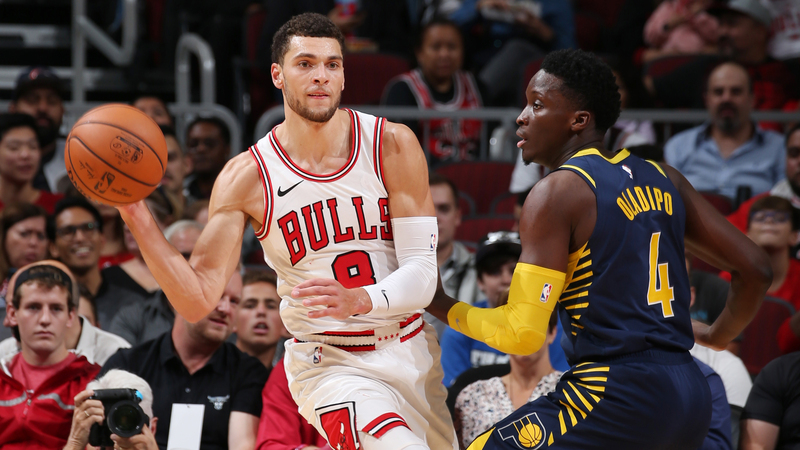 Zach LaVine and Justin Holiday both score 22 points and Bobby Portis adds 20 as the Chicago Bulls take down the Indiana Pacers, 104-89. 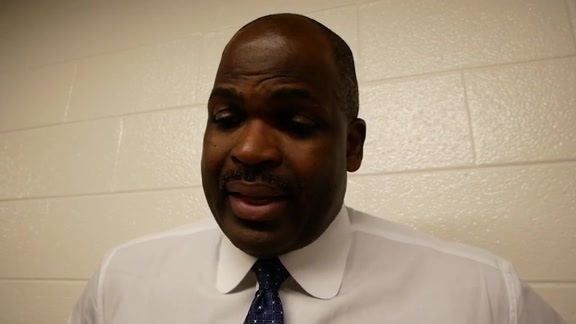 Oct. 10, 2018 - Nate McMillan, Thad Young and Victor Oladipo discuss the Pacers' 104-89 loss to the Chicago Bulls. October 10, 2018: Domantas Sabonis and Victor Oladipo combine on a nice pick-and-roll. October 10, 2018: Tyreke Evans takes a steal the other way for an easy two. 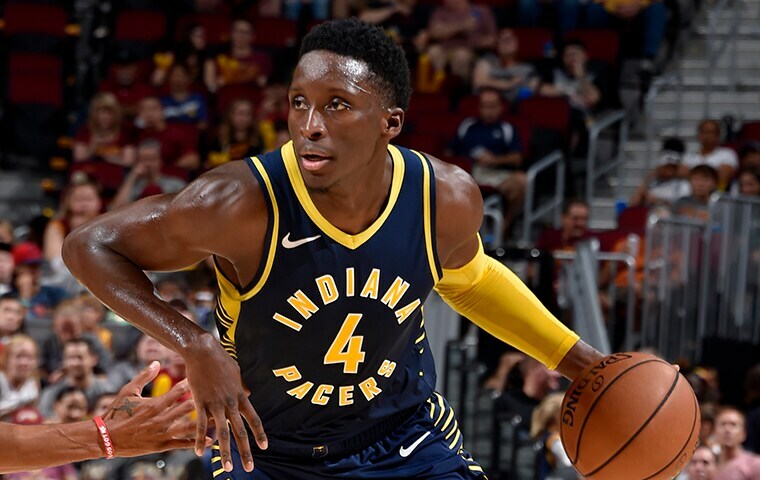 October 10, 2018: Victor Oladipo stops on a dime and drills the 3-pointer. October 10, 2018: Thaddeus Young made his season debut tonight and scored his first points on a tip-in. The grueling nature of an unusual four-game preseason road trip seemingly caught up with the Indiana Pacers on Wednesday night in Chicago. Playing for the fourth time in seven nights, Indiana appeared to hit a wall in its final tuneup before the start of the 2018-19 season, dropping the exhibition to the Bulls, 104-89. The Pacers sputtered out of the gates on Wednesday. Indiana hit just two of its first 12 shots and committed four early turnovers as the Bulls raced out to a 19-6 lead. Domantas Sabonis and the second unit finally provided a little offense, but the Bulls maintained a healthy lead and Jabari Parker's long two as the first quarter buzzer sounded gave the hosts a 34-17 advantage. "I'm just disappointed that we were so sloppy," Pacers coach Nate McMillan said. "We played against a hungry team out there and they got after us. We played like we think you can just flip a switch when the season starts. We’ll get it right on the 17th when we do start, but we have to get back to being hungry." Indiana trimmed the deficit to 10 on a couple occasions in the second quarter, but could not get any closer. Chicago took a 59-41 lead into halftime, then really put the game on ice at the start of the third quarter. The Bulls opened the frame with an 11-4 run to stretch the margin to 25. With the game out of reach, McMillan largely emptied his bench down the stretch. That opened up an opportunity for Pacers rookie point guard Aaron Holiday. Playing against his older brother Justin for the first time, the youngest Holiday brother impressed over the final quarter and a half. The 23rd overall pick in the 2018 NBA Draft racked up 15 points on 5-of-9 shooting (3-of-4 from 3-point range) in just 15 minutes of action. With Holiday leading the way, the Pacers' reserves opened the fourth quarter with a 16-4 run to cut the deficit to 10 with 4:33 to play, but that was the closest they could climb. Starting forward Thaddeus Young — making his preseason debut after missing the first three exhibitions with a bruised foot — was another rare bright spot for Indiana on Wednesday. Young registered a double-double, collecting 16 points on 8-of-12 shooting and 10 rebounds (five of them coming on the offensive glass). Sabonis added 13 points and nine boards off the bench, while All-Star guard Victor Oladipo finished with 12 points and four assists in the loss. Justin Holiday and fellow Bulls guard Zach LaVine led all scorers with 22 points each. Bobby Portis added 20 points for Chicago. The Pacers will return to Indianapolis and have a week to prepare for their regular season opener against Mike Conley and the Memphis Grizzlies next Wednesday night at Bankers Life Fieldhouse. "We came out a little flat tonight, but we had a really good training camp until this point," Pacers forward Doug McDermott said. "We have some practices before the first game, I think we are building as a unit. We will get better and better as it goes on." Oladipo struggled offensively on Wednesday, going just 4-for-15 from the field and committing seven turnovers. He did, however, knock down 3-of-6 attempts from beyond the 3-point arc. Starting center Myles Turner got into early foul trouble, picking up four fouls in the first half. He played just 20:57 on the night and finished with four points on 2-of-8 shooting, three rebounds, and one block. The Pacers did outscore the Bulls 48-32 in the paint on Wednesday. Indiana's reserves outscored Chicago's bench, 45-29. Sabonis came one rebound shy of recording a double-double in all four preseason contests. He averaged 15.3 points and 11.8 rebounds over the exhibition schedule. The Bulls outscored the Pacers 29-9 in points off turnovers on Wednesday. Chicago capitalized on 19 giveaways by the Blue & Gold while Indiana was only able to do minimal damage after 14 Bulls giveaways. Pacers backup point guard Cory Joseph missed his second straight game with a left knee contusion. Second-year forward TJ Leaf, who had started for Young in the past three games, did not play on Wednesday due to a sore right calf. The Pacers and Bulls will meet four times in the regular season. They'll face off in Chicago on Nov. 2 and Jan. 4 and in Indianapolis on Dec. 4 and March 5. The Pacers will host the Memphis Grizzlies for Opening Night presented by Kroger on Wednesday, Oct. 17 at 7:00 PM ET. That game will tip off a whole week of events including two games, social media scavenger hunts, a watch party, and the inaugural Pacers 5K. Learn more at Pacers.com/OpeningWeek.